10.25.06 -- NASA's long-lived Mars Exploration Rover Spirit will finish its 1,000th Martian day Thursday, continuing a successful mission originally planned for 90 Martian days. For a brief time, the sun will get in the way of communications between Earth and Mars spacecraft, but mission teams are well prepared for this natural event called solar conjunction. August 8, 2006 is winter solstice on Mars, the shortest day of the Martian year. NASA's Mars Rover Opportunity has arrived at the rim of a crater approximately five times wider than a previous stadium-sized one it studied for half a year. This video compilation shows images from the Mars Exploration Rover Opportunity's 32 months on Mars. A collection of images from the MER mission over the last 2 years. 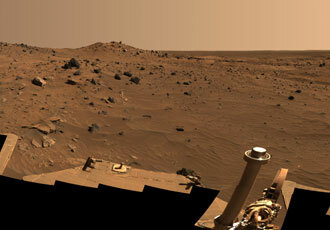 The Mars Rovers Spirit and Opportunity have seen quite a bit during their second Martian year. Part 2 of an interview with rover scientist Dr. Steve Squyres. Today, there have been 11 visitors (63 hits) on this page!